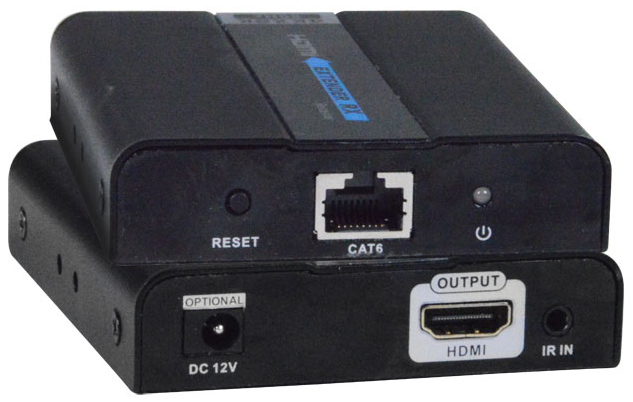 The VOPEX® 4K HDMI Splitter/Extender simultaneously distributes uncompressed Ultra-HD 4Kx2K 60Hz 4:4:4 HDMI video, multi-channel audio, and IR from one video source to up to four displays and speakers, each located up to 100 feet away via CATx cable. The VOPEX-C64K18GB-4 system consists of two components: the 4K HDMI HDBase-T broadcast unit, which connects to the HDMI source and also supplies video to a local display; and a receiver (included) for each remote 4K HDMI display. The units are interconnected by CAT5e/6/6a/7 cable. Transmits an uncompressed HDMI signal over one CATx cable to multiple display locations. Extend Ultra-HD 4Kx2K 60Hz 4:4:4 to 100 feet. Extend 4Kx2K 30Hz to 165 feet. Extend 1080p to 200 feet. Supports Ultra-HD 4Kx2K resolutions (4096x2160 and 3840x2160 @24/25/30/60Hz YUV 4:4:4) and HDTV resolutions to 1080p. Ideal for digital signage, tradeshows, or classrooms where high quality video on multiple displays is needed. One female HDMI connector for video source. Supports Ultra-HD 4Kx2K resolutions to 4096x2160 and HDTV resolutions to 1080p. 4Kx2K (4096x2160 and 3840x2160) at 24/25/30/60Hz YUV 4:4:4. One female 3.5mm port for IR transmitter. Four female RJ45 connectors for sending/receiving ultra-high definition video, audio, IR, and DDC signals. Refer to the resolution chart for resolutions using different CATx cable types and lengths. One female HDMI connector for HDMI display. Does not support DVI displays. One female RJ45 HDBase-T connector for sending/receiving ultra-high definition video, audio, IR, DDC signals. 100 feet (30 meters) for Ultra-HD 4Kx2K 60Hz 4:4:4 over CATx cable. 200 feet (61 meters) for 1080p over CATx cable. Use CATx solid or stranded straight through cable for TIA/EIA-568B wiring terminated with standard RJ45 connectors.